The theme for our youth ministry is "I'M THIRD." Our theme comes from Jesus' response to the Pharisees' question about what commandment was the most important to keep. Jesus told them, and all of us, that we are to love God first, and put others before ourselves. By doing this we put God 1st, others 2nd, and we are 3rd. There you go. That is the background for our "I'm Third" theme. Hebrews 12:2 "Let us fix our eyes on Jesus, the author and perfecter of our faith"
Come join us on Wednesday nights from 6:30-7:30p.m. in the basement for a night of worship and Bible study. We have one intention on Wednesday nights and that is to "Focus" on Jesus Christ, and we do that through praise and worship and Bible study. Sometimes in our fast paced lives we need to come together and get focused on what really matters. We have a blast every week. Come early and stay late if you want to hang out or play in the game room. We have a pool table, a foosball table, ping-pong table, and video games. 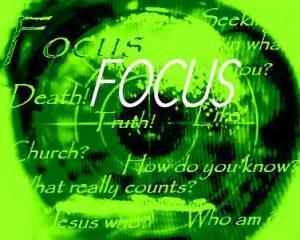 Hope to see you at "Focus" next week. We'd love to have you. Thanks for checking us out. . . Love to have you be apart of our ministry.